Las Vegas, NV, March 27, 2018 –(PR.com)– Las Vegas photographer Christian Purdie celebrates one million photos as he continues to innovate within the field of photography. Blending technical skill with creativity, the Las Vegas based company specializes in a myriad of genres–from events and portraits to headshots. This significant milestone denotes years of hard work that is attributable to Purdie’s passion and keen attitude for his craft. Their latest development, the Share as We Shoot program, is a crucial asset for any Las Vegas event photographer. With a staff that assists on photoshoots and the editing process, Christian Purdie Photography has taken photographs of Sir Richard Branson, Carlos Santana, George Lopez, Steve Wynn, Michael Dell and other high profile cases.Their inventive Share as We Shoot program transforms the nature of professional photography, as it provides clients with nearly instant access to their photographs. Christian Purdie Photography is in no way limited to event photography though. 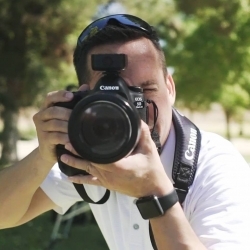 As a Las Vegas portrait photographer, Purdie understands that a picture is worth a thousand words, and that the right picture tells your story. With an extensive knowledge of the Las Vegas valley, Purdie has chosen unique settings to shoot the proper portrait, which has aided in the substantial feat of reaching one million photos.